Arthur Lascañas, a former cop who confessed to being an assassin for the Davao Death Squad, faces a Senate panel looking into extrajudicial killings. In his affidavit, Lascañas has accused President Rodrigo Duterte of ordering scores of killings in Davao City while he was mayor. Poe says Lascañas' appearance might work against his interests as has previously lied to the Senate. She advises the witness to produce others who could corroborate his statements. Sanidad said the search at the Laud Quarry was conducted in 2009. Lascañas said he gave his firearms to his associates. 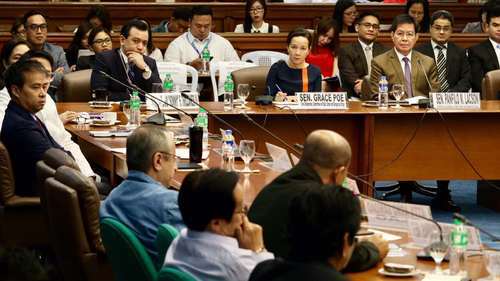 Sen. Poe is inquiring whether witnesses and agencies can produce other evidence, such as the guns used by Lascañas and the bones found in Laud Quarry. FLAG lawyer Arno Sanidad said the Laud Quarry, alleged killing field of DDS, was previously owned by Bienvenido Laud. He said Laud's lawyer is current Justice Sectetary Vitaliano Aguirre II. Sen. Grace Poe now asks Commission on Human Rights representatives about their investigation of the Laud Quarry, the alleged site where remains of Davao Death Squad victims were dumped. Lascañas says the death squad would buy unlicensed firearms, which were usually M45 handguns. He also believes their funds came from the local government through SPO4 Sonny Buenaventura. That Lascañas could not remember the person he first killed puzzles Sen. Ping Lacson. Sen. Grace Poe asks Lascañas who was the victim of his first kill. Lascañas says he does not remember. Lascañas has tagged then Davao police director Ronald dela Rosa, who is now current PNP chief. Differing statements on the nationality of Sali Makdum. He could be Yemeni, Pakistani or Turkish. What's clear is that he was a foreigner. Cross-checking with Matobato's statement: Lascañas said they kidnapped suspected Pakistani national terrorist named Sali Makdum while Matobato said they kidnapped and killed the international terrorist, Makdum, in 2002. Lascañas claims the death squad members were used "foot soldiers" of drug lords. Lascañas narrates another incident involving Chinese who were involved in the drug trade. He says the victims were taken to Laud Quarry. Lascañas says he gave the go signal to kill his brothers, Cecilio and Fernando. Other senators present at the hearing. 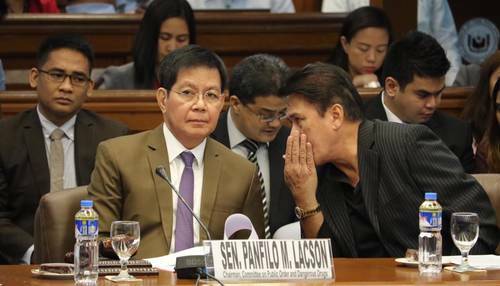 Senate Committee chair Lacson ordered the Police Regional Director to verify Lascañas's claim that Trocio is currently working in Davao City Hall. Sen. Panfilo Lacson presides over the hearing. Beside him is Sen. Tito Sotto. Lascañas tags a certain Jerry Trocio, believed to be still be employed by the Davao City government, who provided intelligence report on Jun Pala. Lascañas said he chanced upon Mayor Duterte in a mall and apologized for the failed attempts on Jun Pala's life. Duterte supposedly told him to take his time. In his affidavit, Lascañas said the first attempt to kill broadcaster Jun Pala was done in the Circumferential Road near Davao Medical School Foundation. The second attempt was done at Mamay Road near Davao International Airport. 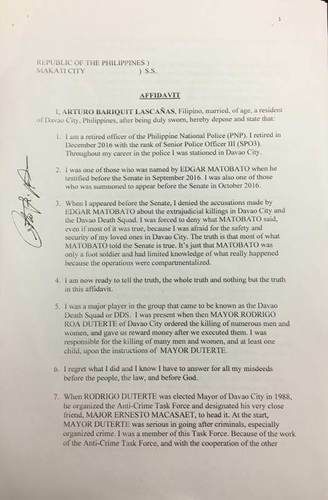 Cross-checking with another self-confessed hitman and Davao Death Squad Member, Edgar Matobato's statement, Lascañas said the death squad was formed in 1989 while Matobato said it was formed in 1988. Duterte won as Davao City Mayor in 1988. Lascañas said they attempted to kill Jun Pala twice via ambush, but the broadcaster was able to escape in both instances. Lascañas reveals that the contract for the killing of broadcaster Jun Pala, who was critical of then Mayor Duterte, was worth P3 milion. Lascañas says others did not agree with his plea to spare the son of the main target. Lascañas claims he protested against the inclusion of Patajasa's family in the kidnapping, but Duterte allegedly gave the go signal. Lascañas recounts the kidnapping of a certain Mr. Patajasa, his wife, son and father in law. Lascañas says Duterte ordered the attack on Muslim mosques in Davao City in retaliation for the bombing of San Pedro Cathedral. Lascañas: Totoo ang Davao Death Squad, totoo naman ang mga sinabi ni Edgar Matobato. Lascañas admits he was one of the more senior members of the Davao Death Squad. "Isa ako sa mga senior na pasimuno..."
Lascañas discusses the structure of the so-called Davao Death Squad. With that opening statement of committee chair PingLacson, expect Lascanas to find a generally inhospitable Senate hearing. Trillanes asks Lascañas to narrate everything from the start. Lascañas apologizes for previously belying Edgar Matobato's testimony, citing fear for his life. Lascañas: I would like to ask for an apology and understanding for what I have said. Arthur Lascañas, a cop and self-confessed hitman, takes his oath. Lacson delivers his opening statement. He advises Lascañas to provide concrete evidence due to flipflopping statements under oath. Lascanas doesn't seem to be in the room yet for the hearing. 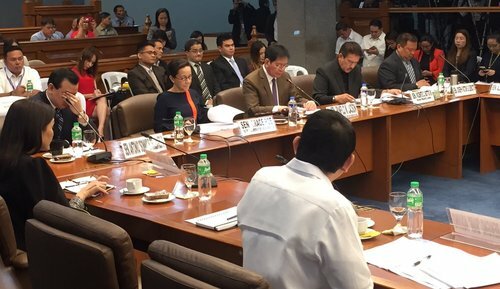 The inquiry led by Sen. Panfilo Lacson has started. Got word that the Senate hearing will start at 10 a.m.
Good morning! The Senate public order panel's public hearing is scheduled to start at 9:30 a.m. But Senate hearings sometimes start a bit later. So stick to this page and wait for the event to go live.